How do I add content to my listing? Adding images, PDFs, FAQs, venue description and more. We encourage venues to own their content on Venuemob. That is – it's up to you to ensure your listing has attractive and informative content for customers. Basically: the more useful/pretty content that's live on your listing, the more visible you'll be to customers, and the more enquiries you'll receive! You'll notice in the Venuemob Manager dashboard there's a section for the Venue's profile score in the top right-hand corner. That's your Content Quality Score. The lower your score, the more content that's missing from your listing – and the further down you'll be buried in search results. The higher the score, the higher your venue will be ranked in our search results! Click on the items that are missing on your profile, listed under Venue profile score, profile completion tips. By clicking on each item, you will be navigated to the section that tip pertains to. Alternatively, click on Venue listing in the lefthand menu to see/add all content. The content in your venue profile is divided into seven subsections: Profile, Function spaces, Pricing, Attachments, Offers and FAQs. The Profile section is where you'll find basic info for your listing. You can see/change your address, and update the event types you're suitable for. Add an image of your venue to appear in search results. This is where you'll find your venue's spaces, as listed on your profile. Click on each space to open the space in editor's view. At least four images per function space – we've identified four or more images as the sweet spot for customers to truly get a feel for what a space is like. To change a function space's name, simply type in the new name in the view above and click save. To add a space description, simply type it into the description box and submit it for review (we'll make sure it's free of spelling mistakes and all-caps SHOUTING). To update the capacity of each space, simply input the new capacity in the 'capacity' section and remember to click save. Log in and set specific minimum spends and hire fees for each function space at different times of the year. Follow our detailed steps to input your unique pricing data. This is where you can upload PDFs such as: menus, function packages and floorplans. It's vital to upload at least one attachment. You can show/hide the PDF by clicking the sliding yellow icon. Venuemob exclusive offers significantly increase your chance of receiving lots of event enquiries from customers. With an offer, you'll be boosted in search results, promoted across our social channels, and in our weekly EDMs. Click Create an offer and select the type of offer you'd like to provide, then select all the nitty gritty details. You'll have a choice between a number of seasonal discounts, or you can choose to create a custom offer. FAQs are an excellent way of minimising the amount of back-and-forth conversation you have with customers. They're also a great way to quickly convey information. Please note – your profile score must be 70% complete + to be able to add an offer. Click on Add to create a new FAQ and answer. You must input a question, and an answer. Does Space A have a minimum capacity? Yes, Space A requires at least 40 guests to book. If you'd like to see our standard list of FAQs, you can check them out here. Make sure you press save! All done? Your venue score should now be 100%! If not? Get a wriggle on, you'll need a high Content Quality Score in order to be visible to Venuemob customers. 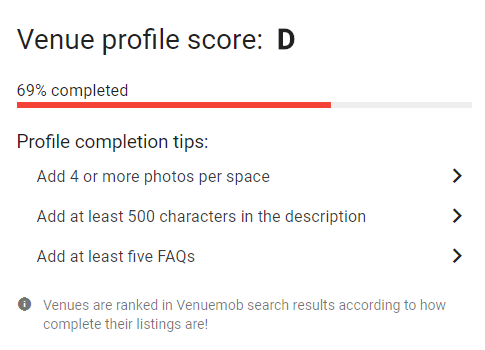 Head to Venuemob Manager to see your Content Quality Score!